2009) will be held in China Import and Export Fair Pazhou Complex on June 30 to July 2, 2009. The largest hospitality industry trade show in China and even in Asia. After 6 years of rapid development, HOSFAIR Guangzhou 2009 featuring over 40,000 square meters. The fair is the fastest-growing and largest hospitality industry trade show in China and even in Asia. �One-Stop� hospitality industry purchasing platform event. 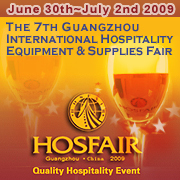 HOSFAIR is leading the trend of hospitality industry in Asia. Displaying the rich exhibits such as hospitality equipment, hospitality supplies, food and beverage etc, and providing a �one-stop� platform for international buyers. The highest degree of international hospitality industry fair in South China. HOSFAIR with high-quality exhibitors and buyers from many countries and regions. During the HOSFAIR Guangzhou 2008, 35,151 trade professionals from 47 countries and regions attended the fair.HOSFAIR has won�2007 China Brand Exhibition Gold-fingers Awards�.